Author: Chet A. Creider, Jane Tapsubei Creider. Series edited by: M. Lionel Bender †, Franz Rottland †, Norbert Cyffer. Nandi is a language spoken in the highlands of western Kenya. The Nandi and speakers of related languages and dialects are collectively known as the Kalenjin peoples. Their languages belong to the southern Nilotic branch among the Nilo-Saharan languages. The Kalenjin languages are as yet hardly documented and thus the present book represents the first comprehensive dictionary in the field of Kalenjin languages. Its aim is especially to document the traditional vocabulary, which is threatened by oblivion. The book continues to employ the standard orthography which is used in informal written discourse, despite the inherent deficiencies. For the benefit of the non-native user an additional phonemic orthography is offered which closely follows the colloquial pronunciation of the lexical items. 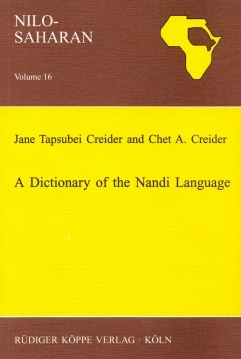 Following a short introductory chapter dealing with orthography and phonology the rest of the book contains the Nandi-English and English-Nandi vocabulary. Every item is provided with extensive phonological, tonological and morphological information, as well as an illustrative phrase or sentence. Following the links below you will find further monographs and paper collections on Nilo-Saharan / Nilotic and Kalenjin languages.